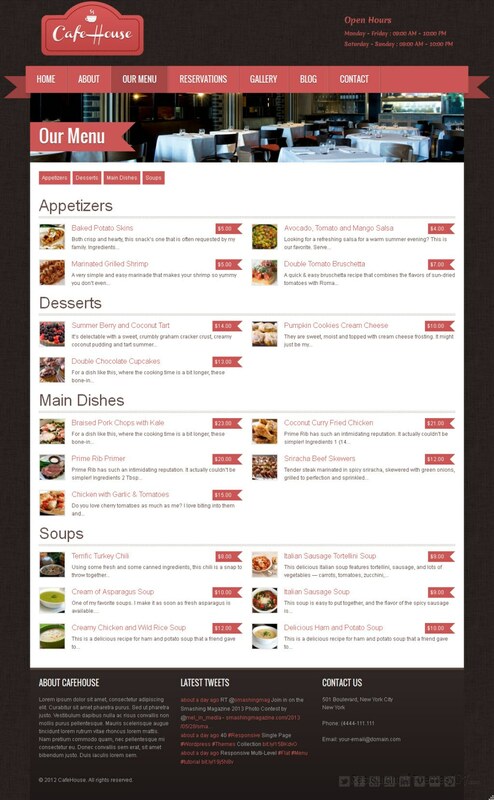 CafeHouse is a responsive restaurant HTML template created by MatchThemes and featured at Mojo themes. 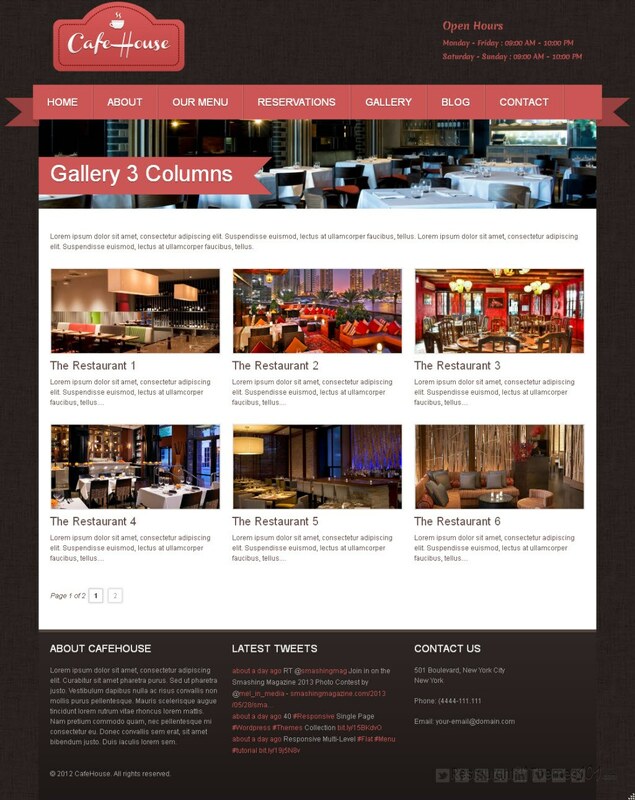 It is a very pretty, clean and elegant theme with a very attractive layout that will leave no one indifferent. 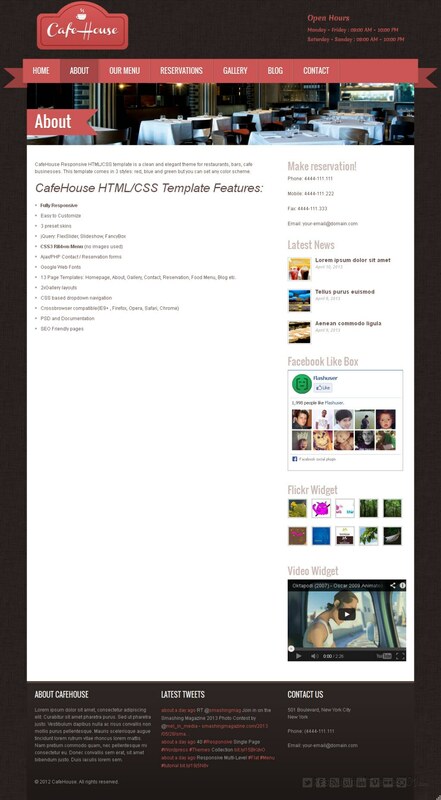 CafeHouse comes with 3 preset color styles you can choose from: red, blue and green. There is a very wide slider featured on the homepage and it’s there for no other purpose but to grab every visitor’s attention. Add great photos of your restaurant or the delicious food you offer, and let them make your guests hungry for your delicacies as soon as they enter your website. You will be able to feature your most important elements right under this slider, along with resized photos and some text. Present your welcoming note here, your menu or your reservations. After clicking the “read more” button right under these posts your visitors will be taken directly to the post pages, where you can tell them everything you want to about your restaurant or your meals. Apart from looking great, this theme also features great options. 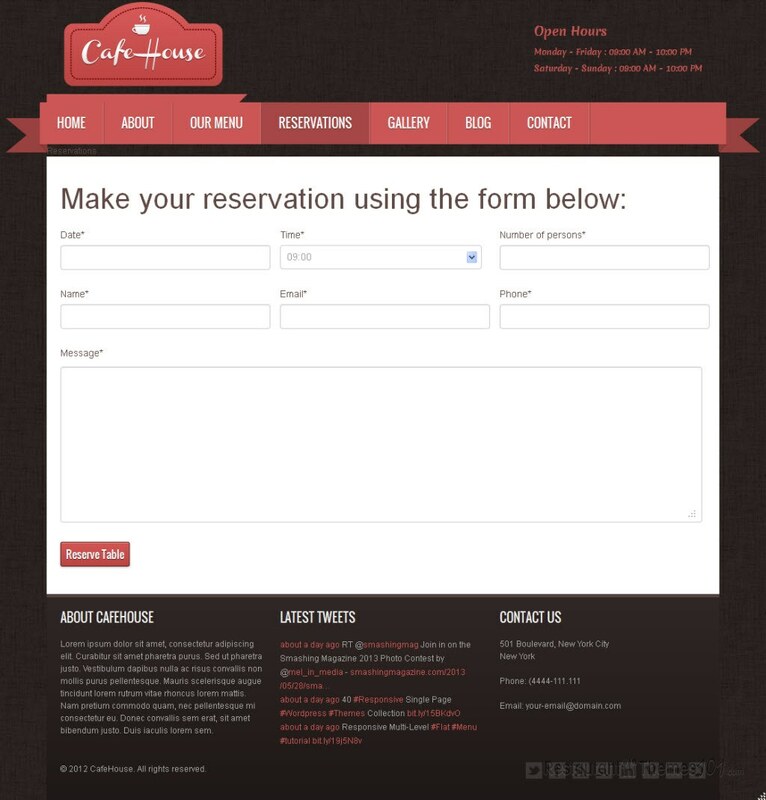 Your visitors will be able to make reservations right there on your website by using a simple reservation form. You will also be able to display your working hours and news and events on your homepage, so everyone can see what’s going on at your restaurant and when is the right time for them to visit. 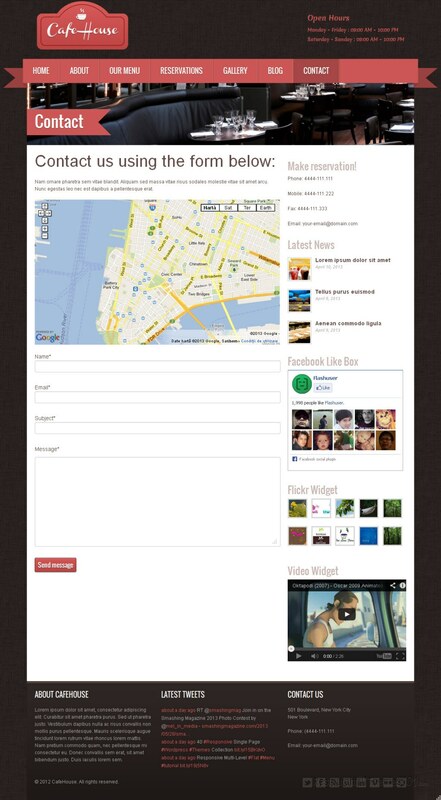 Your website will be connected to all of the popular social networks, and there are separate widgets featured so you can display your most recent tweets, your photo gallery from Flickr and there is a Facebook like button added. The contact page features a simple contact form for your guests to message you and Google Maps so anyone can easily get exact directions to your restaurant. CafeHouse is a responsive HTML coffee shop template and you can be sure it will automatically adapt to any screen size or resolution, desktop or mobile. It is very easy to customize and it meets all the needs of a good website. 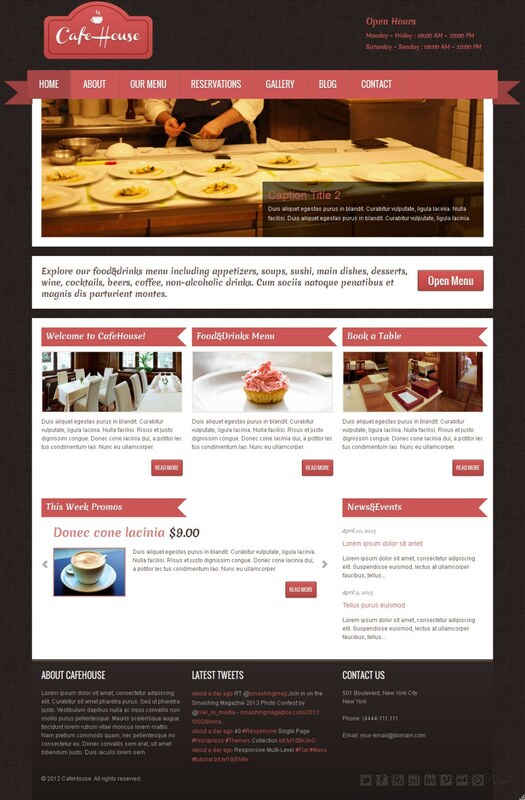 Besides this HTML template you can buy CafeHouse also as a WordPress restaurant theme.